abandoned by his owner who do not want him. A seven years old boy who lived next door had many new toys. He gave me a old clockwork frog and a harmonica. 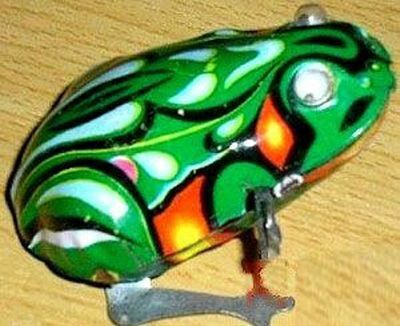 The clockwork frog was green and the harmonica was yellow. I loved them so much. Consequently, I almost fall in love with the ugly boy who’s born in a wealthy family. The toys changed hands and regained love from their new owner. I wrapped the handkerchief around them to keep them free from dust and always carried with when I went outside. I showed them to my friends, whom I’d run into, with much flourish. I was quite satistied with my luckiness. Sitting in a corner of Karaoke Bar, the green clockwork toy reminded me of my childhood. I was wondering whether the toys got a feeling, if they  were alive, that their new owner, a five years old girl, treated them much better than the ugly boy. At the stage, my friend, a beauty, was singing a old popular song that used to be. I held a ice beer can and put it onto my burning cheeks, listening to her, silent. Fact to the real world, every one in their own place play a major role which seems to the others unimportant. The clockwork toy was among the missing a long time ago, and the pleasant memories faded out slowly.